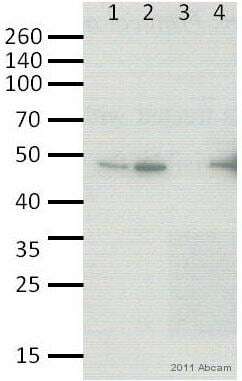 Although some customers are able to use this antibody to cross react with mouse samples, we are unable to reproduce this consistently. Therefore this product is no longer guaranteed for use in this species. Synthetic peptide conjugated to KLH derived from within residues 200 - 300 of Human Runx1/AML1. Antibody batches of a concentration <1mg/ml will have BSA added to them. Our Abpromise guarantee covers the use of ab23980 in the following tested applications. WB Use a concentration of 1 µg/ml. Detects a band of approximately 52 kDa (predicted molecular weight: 48 kDa). 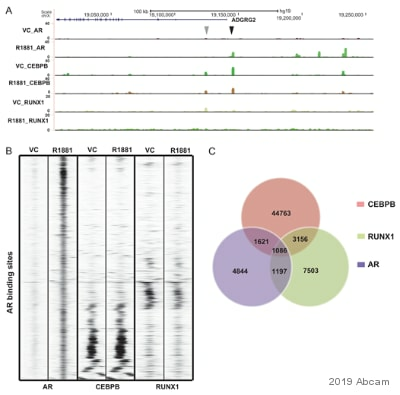 CBF binds to the core site, 5'-PYGPYGGT-3', of a number of enhancers and promoters, including murine leukemia virus, polyomavirus enhancer, T-cell receptor enhancers, LCK, IL-3 and GM-CSF promoters. The alpha subunit binds DNA and appears to have a role in the development of normal hematopoiesis. Isoform AML-1L interferes with the transactivation activity of RUNX1. Acts synergistically with ELF4 to transactivate the IL-3 promoter and with ELF2 to transactivate the mouse BLK promoter. Inhibits MYST4-dependent transcriptional activation. Note=A chromosomal aberration involving RUNX1/AML1 is a cause of M2 type acute myeloid leukemia (AML-M2). 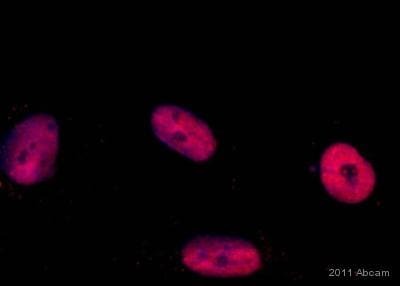 Translocation t(8;21)(q22;q22) with RUNX1T1. Note=A chromosomal aberration involving RUNX1/AML1 is a cause of therapy-related myelodysplastic syndrome (T-MDS). Translocation t(3;21)(q26;q22) with EAP or MECOM. Note=A chromosomal aberration involving RUNX1/AML1 is a cause of chronic myelogenous leukemia (CML). Translocation t(3;21)(q26;q22) with EAP or MECOM. Note=A chromosomal aberration involving RUNX1/AML1 is found in childhood acute lymphoblastic leukemia (ALL). Translocation t(12;21)(p13;q22) with TEL. The translocation fuses the 3'-end of TEL to the alternate 5'-exon of AML-1H. Note=A chromosomal aberration involving RUNX1 is found in acute leukemia. Translocation t(11,21)(q13;q22) that forms a MACROD1-RUNX1 fusion protein. Defects in RUNX1 are the cause of familial platelet disorder with associated myeloid malignancy (FPDMM) [MIM:601399]. FPDMM is an autosomal dominant disease characterized by qualitative and quantitative platelet defects, and propensity to develop acute myelogenous leukemia. Note=A chromosomal aberration involving RUNX1/AML1 is found in therapy-related myeloid malignancies. Translocation t(16;21)(q24;q22) that forms a RUNX1-CBFA2T3 fusion protein. Note=A chromosomal aberration involving RUNX1/AML1 is a cause of chronic myelomonocytic leukemia. Inversion inv(21)(q21;q22) with USP16. A proline/serine/threonine rich region at the C-terminus is necessary for transcriptional activation of target genes. 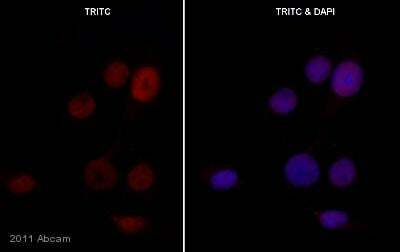 Phosphorylated in its C-terminus upon IL-6 treatment. Phosphorylation enhances interaction with MYST3. 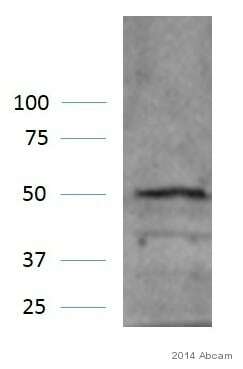 This antibody recognized three distinct bands of between 48 and 55 kDa in Jurkat nuclear lysate. 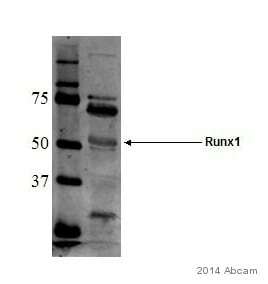 These may represent distinct isoforms of Runx1 or may represent post-translationally modified forms. 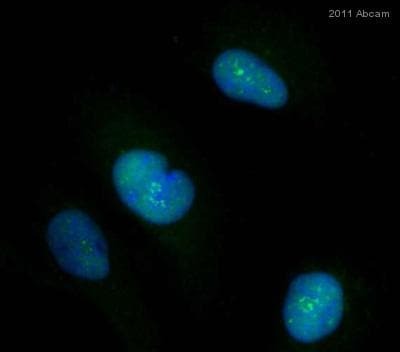 Immunocytochemistry/ Immunofluorescence - Anti-RUNX1 / AML1 antibody - ChIP Grade (ab23980)Image courtesy of an anonymous Abreview. 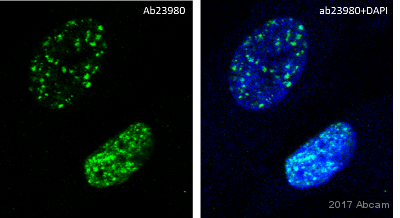 ab23980 staining RUNX1 / AML1 in human glioblastoma cells by Immunocytochemistry/ Immunofluorescence. The cells were fixed in paraformaldehyde, permeabilised in 0.1% Triton X-100 and then blocked using 0.5% BSA for 20 minutes. Samples were then incubated with primary antibody at 1/50 for 16 hours at 4°C. 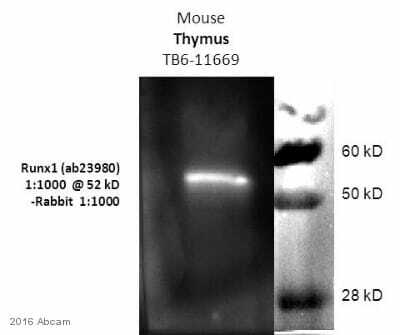 The secondary antibody used was a goat anti-rabbit IgG conjugated to Cy3® used at a 1/400 dilution. Publishing research using ab23980? Please let us know so that we can cite the reference in this datasheet.